Akshaya Tritiya, also known as Akha Teej is a holy day for Hindus & Jains. Traditionally, people buy gold coins & jewelry on Akshaya Tritiya. Jewelers often stock up new designs for Akshaya Tritiya offering irresistible rebates making it next to impossible not to shop for gold jewelry on this auspicious day. We all own gold jewelry that is seldom worn on a daily basis. Here are a few ideas to help pair your gold jewelry from you mom’s collection with everyday clothes. 1.Wear the bangles with everything. 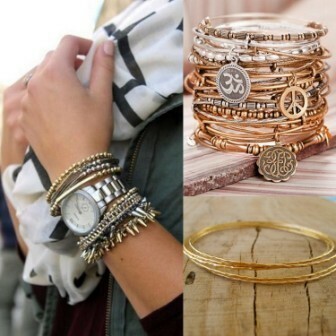 Bangles are easily the most versatile piece of jewelry. Even the heavy kadas work as great statement pieces & they go well with western wear. Stacking has been a big jewelry trend in 2014. So go ahead stack them with some silver bangles &a watch if you must. 2.Flaunt your blings. Who doesn’t love wearing diamonds? But restricting their usage to big weddings might not be the wisest decision.You might not be getting the best out of them if you do that. Pair them with an LBD or LWD if you like for a candle light dinner or an office party. 3. Wear heirloom rings& finger rings you have outgrown as pendants. They look cool & are great conversation starters. 5. If you think wearing gold jewelry is a passé, try re-inventing them by pairing them with leather &seude cords. 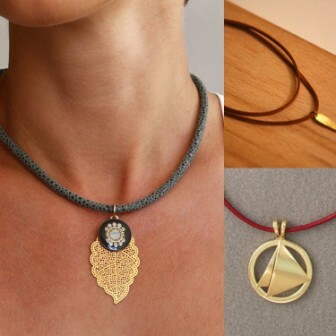 A boring old pendant on a simple suede cord can transform into a boutique jewelry piece. This Akshaya Tritiya, if you decide to shop for jewelry, these tips should help you find something useful. >Skip the traditional designs if your wardrobe staples include dresses, pant suits & denims. Invest in pearls instead. > While Akshaya Tritiya has always been about gold, if the price ranges scare you, consider pure silver jewelry. These come in exciting designs & affordable ranges.